MILLIS – Students and staff heading back to class at Clyde Brown Elementary School Wednesday will see that construction on the site’s new school did not take a summer break. Town Meeting approved the $51.76 million new elementary school in November 2017, to replace the aging Brown Elementary. Students will attend classes in the old building this year, which is on the same property as the new building, then move into the finished product next fall. “The kids will be in there a year from now, just about,” Jurmain said. Structural walls are all up, she said, and contractors poured the concrete for the new school’s gymnasium floor last week. Roof work is underway, and exterior masonry work should start this week. 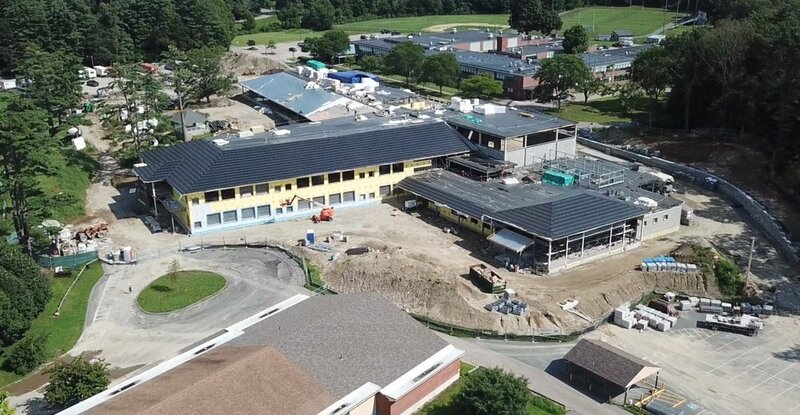 The construction is a Massachusetts School Building Authority-approved project, which means Millis will see about $20.95 million in state funding to get it done. So far, Jurmain said, the project is on time and under budget. The actual building could be complete as soon as July, Jurmain said, then road and sidewalk work will begin, and the old school will be demolished. An official opening is scheduled for the Monday after Labor Day 2019. This school year, Jurmain said, contractors expect to make the building weather-tight for the winter by November. The walls, roof, and exterior masonry should be finished, and the majority of the remaining work will be inside. That’s less distracting for students, Jurmain said. The construction site is completely separate and fenced off from the current school site, however, she said, and deliveries and certain types of work have been scheduled outside of school hours or around events. That lessens the impact on students and staff in class. For residents, the biggest change will be a new traffic pattern this school year. There’s a new traffic light and left turn lane on Rte. 109, and the two roads flanking the old school – Park Road and Park Street – have changed purpose slightly. Park Road is now two-way, and the only way to head west on Rte. 109 when leaving the school. Cars leaving via Park Street will only be able to take a right and go east. School begins district-wide Wednesday. To see a graphic of the traffic changes and keep up-to-date on the project, head to the Millis School Project Facebook page, at https://www.facebook.com/millisschoolproject. FALL RIVER — The lights are on at the future home of Atlantis Charter School. The hot water was just turned on the other day. “No leaks. That’s a good sign,” Mike Lauro, the associate executive director of the Atlantis Charter School, joked as he walked through the school’s new building near the South Watuppa Pond on Tuesday. The 98,000-square-foot building — designed to accommodate 1,400 students from kindergarten through the 12th grade — is tentatively scheduled to open for classes when students return from their winter vacation on Feb. 26. For the next month and a half, construction and electrical workers will be putting the finishing touches on the building, which features three wings open-concept classrooms, cafeterias, common spaces and a gymnasium. Administrators and teachers will also be working on the logistics of moving equipment, office furniture and other materials from Atlantis’ three current sites in Fall River to its new facility on Jefferson Street. “There’s a lot of hard work to be done on the logistics,” said Robert Beatty, the executive director of the Atlantis Charter School. On Tuesday, Beatty toured the new building with other Atlantis officials. He showed the separate wings that will house the lower school — Grades K-6 — and the upper floors reserved for upper grades. Beatty walked down wide hallways designed with large windows to illuminate those spaces with natural light. He poked his head into a science classroom and pointed out the projector above the white board, which every room will have. After more than 20 years in operation as one of Massachusetts’ oldest charter schools, the founders’ vision of a K-12 school with a connection to the waterfront has finally just about come to fruition. The school’s 40-acre site will provide opportunities for rowing and sailing. Also, officials are planning to build an athletic stadium to support multiple varsity, club, elementary and middle-school sports across the local community. “Educational attainment is the primary driver in the economic growth of any community, and we applaud Atlantis Charter School for their commitment to expanding their campus and the new and innovative programs that will make a meaningful impact,” Nicholas Christ, president and CEO of BayCoast Bank, said in a prepared statement. On Tuesday, Atlantis Charter School also announced that it has received an $80,000 gift from BayCoast Bank to support its newly-launched capital fundraising campaign. Atlantis is looking to raise $2.5 million to help fund the construction of the $35 million state-of-the-art campus. Construction began in the Fall of 2016. “The project is ahead of schedule and under-budget. You can’t ask for much more. We’re excited,” said Patrick Long, of Partners Insurance Group and BayCoast Bank who is also an Atlantis Charter School board member. Beatty and Lauro said they wanted the project to be as cost-effective as possible and looked for savings wherever they could. Beatty added that the capital campaign will help Atlantis provide students with an optimized learning environment and invest more money directly into academic programs. “Overall, this is a huge upgrade for all our kids,” Beatty said. Peabody, MA – Agostini/Bacon Construction Joint Venture recently completed the new J. Henry Higgins Middle School, a $70 million, 226,000sf state-of-the-art building consisting of a new 500-seat auditorium, a 500-seat cafeteria, gymnasium, classrooms, and administrative spaces. The project was designed by Dinisco Design Partnership of Boston. The new school was built adjacent to the old middle school that was subsequently abated and demolished. New playing fields with additional site improvements are currently being constructed where the previous middle school was located. The project exceeds the new standards under the commonwealth of Massachusetts sustainable building codes and will achieve LEED Silver certification. Providence, RI – Bacon Construction of Rumford recently completed the new $69 million Richard E. Beaupre Center for Chemical and Forensic Sciences at the University of Rhode Island. The Beaupre Center houses URI’s chemistry department, along with a federal Center of Excellence for Explosives Detection, Mitigation and Response, one of the county’s most important research and training resources in the war against terrorism. Replacing Pastore Hall, which was built in 1953 and accommodated 800 students, the new center triples the amount of space for teaching labs, serving more than 7,000 chemistry students yearly — roughly 1,400 per day — and also greatly expands the space for research laboratories, providing facilities for faculty members researching technologies and applications to benefit the nation at large, including developing advanced batteries for energy-efficient cars, improving magnetic resonance imaging (MRI) scan machines, and creating new early disease detection methods. Fourteen 14 teaching labs and 18 faculty research labs, with a total of 172 fume hoods. The 240-seat Victor J. Baxt Lecture Hall and another, smaller, lecture hall. The Teknor Apex Instrumentation Lab. The building exterior features a number of façade materials including gray face brick, manufactured stone, phenolic resin, composite metal panels, and a significant amount of glass curtainwall and punched window opening, allowing for natural lighting and views of the surrounding campus. The interior consists of Nora rubber flooring in all corridors and labs, while carpeting and porcelain tile were used throughout the common areas. The surrounding site was upgraded with new underground drainage, parking lots, lighting, concrete walks, and a large new seating plaza off of the second floor egress. The building has achieved LEED Silver and is expected to use 50% less energy than comparable existing buildings, resulting in a 20% savings over and above the minimum Rhode Island Energy Code. Scituate, MA – Bacon Agostini Construction Joint Venture of East Providence, R.I., recently won the bid for the Scituate Middle School project. As the general contractor, Bacon Agostini joins owner’s project manager, Daedalus Projects Inc., and Architect, Dore & Whittier Architects, Inc. to manage the completion of this middle school in time for the start of the 2017-2018 school year. NEW MINISTRY: George and Mary Agostini, parishioners of Our Lady Queen of Martyrs Parish, Seekonk, pose with student and staff participants of a recent alternative spring break trip. SMITHFIELD — Students at a recent Sunday evening Mass celebrated in Bryant University’s Interfaith Center chapel were eager to share stories about spring break. However, unlike most of their peers, the group of 15 students had spent their spring break not on the beach, but in Washington D.C., where they participated in community service with a number of nonprofit ministries. The students were part of an alternative spring break trip, one of several new opportunities made possible by a recent donation to Catholic and Christian ministry at the university. Bennetti and other students were able to participate in the trip due to a generous donation to campus ministry by George and Mary Agostini, parishioners of Our Lady Queen of Martyrs Parish, Seekonk. Among other initiatives, the donation will fund the hiring of a part-time Catholic campus minister to coordinate religious programs and community service, including future alternative spring break trips. Built by Agostini and Bacon Construction, the new high school in Plymouth, Mass., is a huge undertaking for these seasoned firms. Coming soon to Plymouth, Mass., is a newly constructed $90.3 million school – a big budget for a big, 248,000-square-foot high school. Although the size and cost are monumental, the job isn’t too big for Agostini Construction and Bacon Construction, two companies run by one family. Plymouth South High School is a Bacon Agostini Construction joint venture that broke ground in July 2015 and will be completed by May 2017. Check out this great write up about our on-going construction of the new Beverly Middle School in The Salem News! When it opens its doors in 2016, the University of Rhode Island’s Center for Chemistry and Forensic Sciences will provide more than just classroom and lab space for a large segment of the university’s student population. The $68 million center will provide state-of-the-art facilities for faculty members researching technologies and applications to benefit the nation at large, including developing advanced batteries for energy-efficient cars, improving magnetic resonance imaging (MRI) scan machines and creating new early disease detection methods. The center will also house one of the county’s most important research and training resources in the war against terrorism, the U.S. Department of Homeland Security’s Center of Excellence for Explosives Detection, Mitigation and Response. We were featured in US Builders Review! A family-owned and-operated company since 1967, Agostini Bacon Construction Companies has been providing construction management and general contracting services throughout Rhode Island, Massachusetts and Connecticut. Located in East Providence, Rhode Island, Agostini Bacon specializes in public and private educational facilities as well as municipal work.